J.O. began racing big wheels at an early age and has been racing since. He raced go-karts from age 5 until he was 14, compiling several track championships with the help of his father, Joel Nobles. When J.O. turned 14, he got his first latemodel, a Russel Brown car. A few years later, he purchased a Bullit chassis. He assumed the number 46, derived from his father's number 49. The father and son team raced together and against each other for the first few years, then they decided to concentrate on J.O. 's career. In 1999, J.O. got his first Warrior race car, and he changed his number from 46 to J0. Last season, J.O. 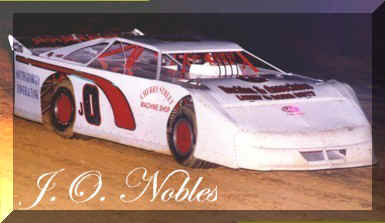 brought home the 2000 Latemodel Points Championship for Golden Isles Speedway in Waynesville, GA driving the Bullit. J.O. won the April 21 feature at Putnam County Speedway.